Friday, 16th March 2012, our audience learnt the sad news of our lovely Brian ‘Dipper’ Duddy is to retire early from drumming due to illness. Dipper has always brought fun to ‘Vintage Jazz’, inheriting the ‘boos’ from Dave Stradwick, a trait started by our ‘mafia’ table and resounded by the whole audience (and echoed by other clubs now), to show appreciation! Dipper would hold up his sticks with a certain gesture! Dipper’s situation will now end an era of a great band – the ‘dancers’ band – ‘Vintage Jazz’. They have been our house band, appearing every other week since 1991. Twenty years is a long time, in which we have seen many changes within the band. Obviously, we loved them and wish to thank all the musicians who has ever played for the band. The following write-up we posted in March 2009 sets out who was in the band and its various changes. However, since then, we have seen more changes, i.e. Barry Palser replaced John Howlett on trombone, John Lee replaced Harry Brampton on clarinet/sax, Alan Snook replaced John Shepherd on trumpet and Gerry Ingrams replaced Terry Knight on double bass. Of course that left us with only Colin Scudamore on banjo, being the only remaining original player and even he has only been able to play on a few occasions (being depped by Nick Singer). In the last year, Dipper’s other half Ann, has courageously held the fort to keep the band together, but has finally decided that ‘Vintage Jazz’ must end. Keith and I are so pleased to have shared those very many happy and exciting moments with ‘Vintage Jazz’, moments to treasure. 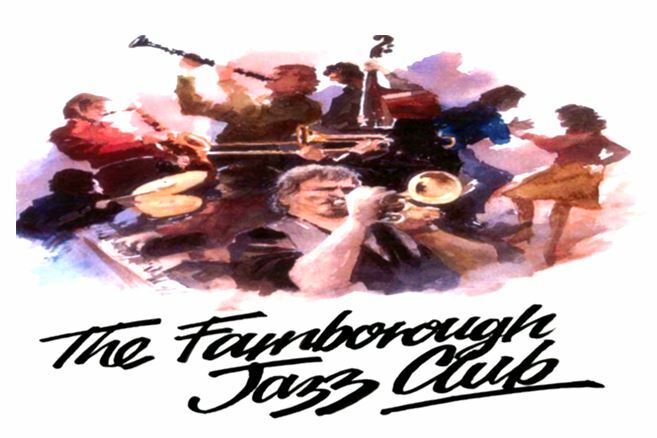 Sadly, their last appearances at Farnborough Jazz, Kent, are to be 13th April and 11th May 2012. We published the following item in March 2009 and sets out musicians who have made ‘Vintage Jazz’. If I have left anyone out, please send an email and I will update. Also, if you have any anecdotes you wish to add, please don’t hesitate to let us know. Thanks. ‘The Vintage Jazz’ has been with us (almost) from the start at Badgers Mount Hotel (originally in the Eagles Nest of the Black Eagle Pub) and because I love to dance, they soon became our house band. That would have been back in about 1991. Tony Scriven was their leader and drummer. However, Tony moved north to run a hotel and then to Portugal. Brian ‘Dipper’ Duddy followed. They had (the Late) ‘Jumpin’ Jack Gilbert on clarinet. Harry Brampton followed. Dave Stradwick was on trumpet. Dave left to form his own band and Dave Wasket took over, followed by John Shepherd, to name a couple. Finally Alan Snook took the slot. John Shelley was on trombone with (the Late) Ray Holland on double bass. Terry Knight followed. Colin Scudamore was on banjo, but due to business commitments, Colin can only play occasionally. Harry Brampton on clarinet, John Keene on trumpet, John Howlett on trombone (John Shelley might come for a blow), Brian ‘Dipper’ Duddy on drums (leader), Terry Knight on double bass and Colin Scudamore on banjo. Leader/drums – Tony Scriven. Tony moved north to run a hotel and then moved to Portugal. ‘Dipper’ Duddy followed. Clarinet – (late) Jumpin’ Jack Gilbert. Harry Brampton followed, who has retired. John Lee (also tenor sax) has now joined the band. Trumpet-Dave Stradwick. Dave left to form his own band. Dave Wasket followed, then John Shepherd, to name a couple followed. Finally, Alan Snook joined. Dave Stradwick sometimes dep’s when Alan is away. Trombone-John Shelley. Unfortunately, John Shelley is unwell, so meanwhile, we have Barry Palser filling in until John returns. Double Bass-(late) Ray Holland. Terry Knight followed and he now arranges who will be playing. Banjo – Colin Scudamore. Due to business commitments, Colin can only play occasionally. Nick Singer or Jim McIntosh (‘Just Jazz’ Magazine) will take Colin’s place, when Colin is not available. Vintage Jazz has great appeal, particularly to dancers, playing fast, medium and slow tempos.